NEW ORLEANS (Feb. 20, 2018) – “Le Bouquet d’Amour,” an important painting by modern master Marc Chagall, will hit the auction block at New Orleans Auction Galleries during its March 17-18 Estates Auction. With a pre-sale estimate of $900,000 to $1,200,000, the painting is the most significant and highest priced work by the artist ever offered at auction in the South. 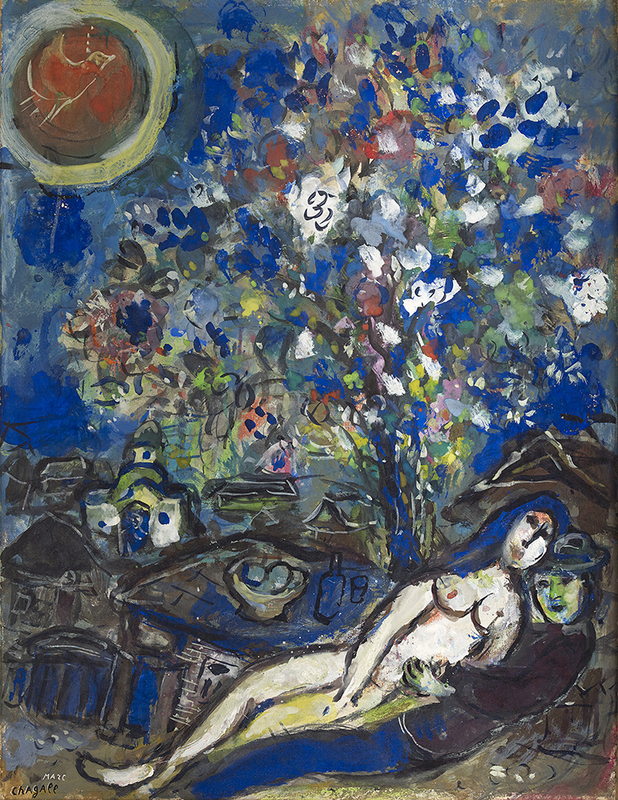 New Orleans Auction Galleries offered a much smaller painting by Chagall from the same collection in December 2017 that soared to $250,000 after bidding started at $140,000. Originally part of a private collection in Geneva, Switzerland, the painting passed through William A. Findlay, Chicago, before reemerging at Sotheby’s New York in 2007. “‘Le Bouquet d’Amour’ is a symphony in blue that exemplifies the magical, dreamlike poetry of Chagall’s work,” says Nicole Casi, Ph.D., Fine Art Specialist at New Orleans Auction Galleries. The painting includes some of the most recurring themes painted by the artist: lovers, flowers and the crowded rooftops of his childhood village in Vitebsk, Belarus (then part of the Russian Empire), where Chagall met his young bride Bella Rosenfeld. Bella was Chagall’s endless muse and ultimate raison d'être as an artist. She represented a purity of love that spilled forth in his paintings, defying gravity and perspective, causing figures to soar through the skies and objects to dance in tandem in a kaleidoscope of colors and forms. The full catalogue will be available at www.neworleansauction.com on Friday, March 2. The gallery opens for public exhibition on Monday, March 5 and an evening reception offering cocktails and hors d’oeuvres will be held on Thursday, March 15 from 5-7:30 p.m.
For a private viewing prior to the public exhibition or for more information on bidding, please contact New Orleans Auction Galleries at 504-566-1849 or info@neworleansauction.com. New Orleans Auction Galleries, one of the nation’s leading regional auction companies, has offered rare, unique and notable items, including fine antique furniture, paintings and estate jewelry since 1991. Houston businesswoman and philanthropist Susan D. Sarofim acquired the auction house in 2012.